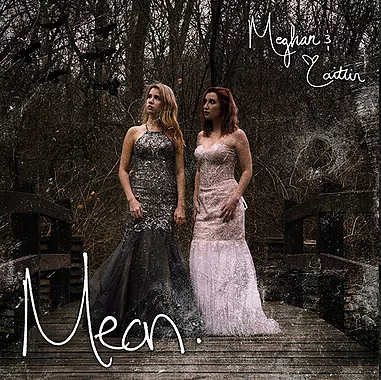 This Valentine’s Day a group of Elmhurst College students teamed up with student-created record label, Schnauz Records, to release a new song from pop duo Meghan & Caitlin. The two-person group features sisters Meghan and Caitlin Foley, based out of nearby Villa Park. The new single coming out on the Schnauz label is aptly titled “Mean.” Written entirely by the indie pop duo and “based on a true story” of teenage angst and betrayal, the distressed lyrics are relatable and relevant. Meghan & Caitlin describe their style as “indie pop with a twist of blues.” The Irish sister duo is active in the national music scene, splitting their time between gigs in Chicago and Los Angeles. They were signed to Schnauz Records by Matthew Zoppa, an EC student double majoring in music business and marketing. He admits that the Gretsch Recording Studio was the perfect place to record Meghan & Caitlin’s new single because the space is modern and relatively inexpensive. In total, Meghan & Caitlin recorded three songs on the EC campus, all engineered by music studies students working with seasoned music professor John Towner. Towner, a graduate of EC’s music business program himself, has been a recording engineer for nearly 40 years. He has inspired many EC students to pursue music as a career. “Before, I was just a kid who liked to play music and organize things,” laughs Zoppa, remembering how his interest in producing music first started. Now that he’s been exposed to the world of music production, he can’t imagine doing anything else. Gablin, EC music business major and CEO of Schnauz Records, started the label in 2015. Originally, it was a convenient way for the artist to release his own music. Eventually, the brand grew, and he began recording his friends’ music. Once Gablin’s business took off, he enlisted the help of other EC students in producing music for emerging local artists. Today, there are numerous students on the Schnauz label, including Nate Baxter, Nick Zoppa, and Adela Skowronski. The newly formed group of music business majors at EC teamed up to produce Meghan & Caitlin’s new single after receiving their digital submission nearly a year ago. The Schnauz Records team has been working to promote the single, from creating social media posts to coordinating rehearsals and arranging music. “What’s unique about [Meghan and Caitlin] is that what you are hearing on the record[ing] is authentically who they are,” says Zoppa. For EC students, it’s important to give artists control over their work. Schnauz Records tries to give emerging artists the space to be genuine. They believe that music is art and entertainment, and that both should be spontaneous. “We tried to stay as far away as possible from touching the song. We just … produced the best recording possible,” he says. Meghan & Caitlin plan on working with Schnauz Records in the future to produce and promote their music. The new single is available on streaming platforms like Spotify, iTunes, Apple Music, Google Play, and Amazon as of February 14.